During this two-day workshop, students engage in intensive playing of string quartets ranging from the quartet standards of Haydn and Beethoven to contemporary, living composers such as John Adams. Del Sol Quartet members work intensively with the students, creating a musical journey of discovery and fun in an encouraging and energized environment. $300. No application fee. Scholarships available for those with demonstrated financial need. Tuition due upon acceptance. Payment via check or credit card accepted. Credit card payments will include a 3% processing fee. Auditions this year will be submitted through video by March 22, 2019. See “audition requirements” for video requirements. Previous Quartetfest participants do not need to submit a video with their application. 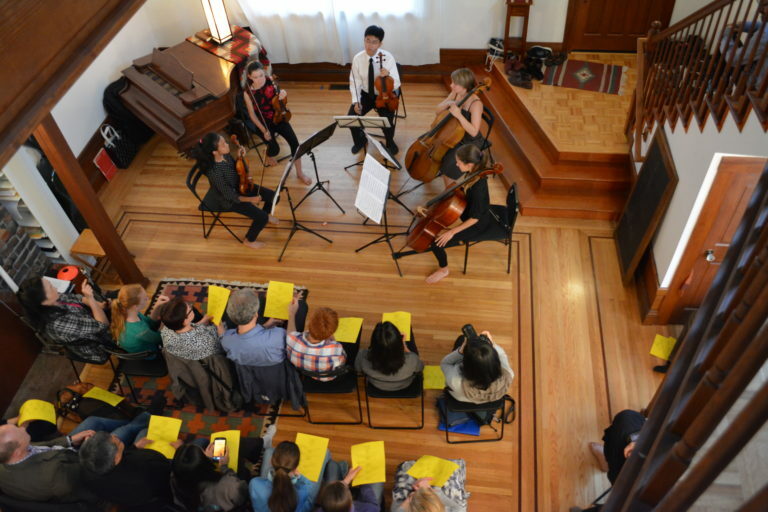 Del Sol’s unique QuartetFest program is a nationally regarded model for coaching of young string players in chamber music performance. 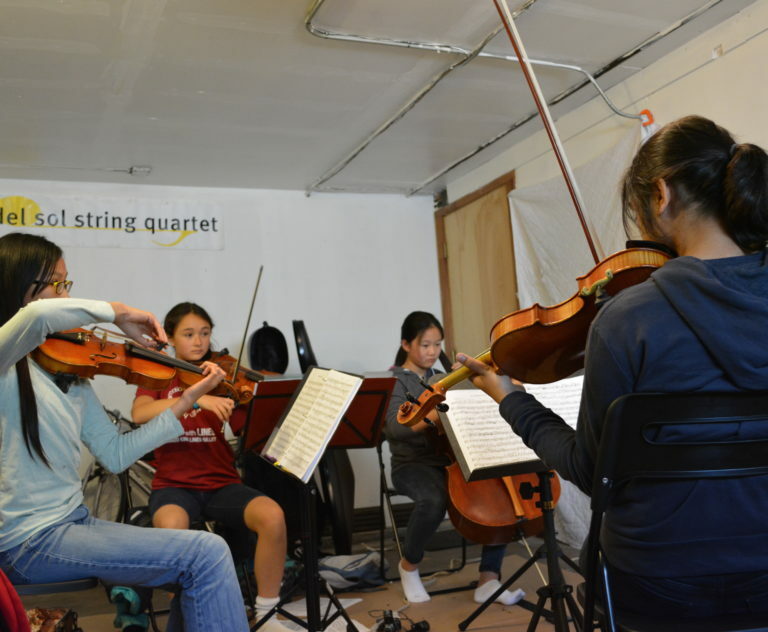 As one of the Bay Area’s premier training workshops offered to serious young musicians, QuartetFest has served hundreds of students, ages 8-18, in the last two decades. The program trains young musicians in the art of the string quartet in an encouraging and energetic environment, and guides them on a creative journey of musical discovery and fun! We are switching to a 2-day intensive workshop focusing on rehearsing and coaching strings quartets. Limited to 4 quartets. Participants may sign up for both sessions. This five-day summer workshop is a superb opportunity for intensive rehearsals, coachings, masterclasses (with focus on various dimensions of music making) and performances (both of students and of Del Sol). Students will also engage in composer projects, learn relevant music theory and history, explore the physics of sound, and create a sound collage from samples they collect throughout the week. To audition, students should be between 11-18 years old, and have several years of private instruction in order to be comfortable with ensemble playing. Previous Quartetfest participants do not need to submit a video with their application. • Audition videos should be approximately 5 minutes long in total. • Please upload to Youtube as private link and share the link with quartetfest@delsolquartet.com. Do not directly send us files to download. • Applicant should make sure the video link is working, and will not expire for at least three months. • Rhythm audition: Note that when creating video for the rhythm audition, turn off the metronome. And record rhythm excerpts in the correct order. -1 musical selection that captures student’s current level (NO piano accompaniment). -rhythmic exercise: please watch the demonstration video and download the QuartetFest Rhythms Audition for your audition . Please contact quartetfest@delsolquartet.com with any questions or concerns. This year, each student will be considered for one of the quartets in their level. Levels are determined by playing ability, chamber music experience, and age. Because of the nature of our workshop, we highly encourage pre-formed groups to apply, whether or not they have working together throughout the year. Pre-formed groups will have their applications to Quartetfest receive special consideration. To apply as a pre-formed group, we require at least three members – all registering for QF and all signing up for the same group on the application.